Did you know Goa has its own shadow dancer? If you are in Goa and want to explore the cascading beauty of the Dudhsagar waterfall, which comes in the jurisdiction of Bhagwan Mahavir Wildlife Sanctuary, then you have to cross a village called Collem, in Dharbandora taluka. This pristine village is encompassed with the Western Ghats and Mhadei river flowing through it. To experience it in full bounty one should visit it in monsoon and if you are observant enough than you may even encounter a species of a dragonfly, which is quite new to science. This particular species is reported only in one stream near Collem village and from another location in Kerala. It is known as Idionyx gomantakensis or “Goan Shadow Dancer”. Idionyx as a genus are weak fliers and can be seen hovering around perennial streams. The genus Idionyx is referred to as the Shadow Dancers due to their behaviour of preferring cloudy overcast weather and also their jumpy hovering flight. They have a peculiar habit of hanging from vegetation. This species was discovered by Goa-based researcher and programme manager of Goa Mineral Foundation Parag Rangnekar. “The Goan Shadow Dancer was discovered during one of the surveys that we had been conducting to document odonate diversity in the state in 2008,” says Rangnekar. Dragonflies belong to the order Odonata, characterised by large multifaceted eyes, two pairs of strong transparent wings and an elongated body. They are mostly found in wetlands and in areas like lakes, ponds, streams because their larvae, known as “nymphs”, are aquatic. They spend a large part of their life under water as an aquatic predator that feeds on fish, tadpoles and other aquatic insects. They were among the very first winged insects to evolve over 300 million years ago. “The transformation of a nymph from its watery abode to the winged aerial predator is probably the most dramatic transformation in nature,” says Rangnekar. Rangnekar got into the study of odonates and this new species by accident. It was when he met R J Andrew of Hislop College, Nagpur, during his visit to Goa around a decade ago, who told him about a paper on dragonflies of Goa. The paper was published by the Zoological Survey of India (ZSI) in 1991-92, based on the field research done in 1966-67. “The paper documented 22 species, which are commonly found and are not forest species. However, during our field trips we photo-documented at least 40 species,” says Rangnekar who is also the author of the book A Photographic Guide to the Butterflies of Goa. The dragonfly diversity in Goa was not well documented till 2008. The process of naming of this species took five long years. It was done in co-ordination with scientists from ZSI. Studying any new species involves years of observation, taxonomic studies and collecting ecological data. Rangnekar maintains that unlike some other insects that can be identified based on colours, dragonflies show variation in colour with age.Rangenkar and his team along with scientist K A Subramanian, who works with ZSI, Chennai, have now published a paper on this new species titled Goan Shadow Dancer. While speaking about the importance of this species which is endemic to the Western Ghats, he says that Goa is in a unique position in the Western Ghats being at the confluence of the Northern and Southern Ghats. “New species within various taxa are being discovered here. When one finds a new species within a taxa group that is better known, it is always exciting and speaks positively about the habitat and the need to conserve it. This species, which is restricted to the undisturbed forest habitats and is known to breed in non-polluted free flowing forest streams,” explains Rangnekar. Researchers such as Omkar Dharwadkar, Rohan Naik, Sridhar, and Dhiraj Halali, led by Rangnekar they have documented 103 species known from Goa including this new species. But, even a decade ago, this number was unimaginable. Rangnekar says that it is due to the fact that Goa as a region was not historically surveyed since it was governed by the Portuguese unlike the rest of the country under the British. The first formal surveys happened only after Goa’s liberation in 1961. Rangnekar is now in the process of compiling 103 species in a book that will also have names in local Konkani. Odonates are bio-indicators and studying their life cycle gives us an idea about our wetlands and ecology as a whole. “Odonates are not only important for water-rich habitats but they are also significant for habitats where water is scarce, and therefore are regarded as a group of insects vital to the survival of life,” says Ashish Tiple, assistant professor and head, Department of Zoology, Vidyabharati college, Seloo, Wardha, Maharashtra. He further says that adult odonates feed on mosquitoes, blackflies and other blood-sucking flies and act as an important bio-control agent of these harmful insects. In the urban areas of Thailand, larvae of the container breeding dragonfly, granite ghost (Bradinopyga geminata) was successfully used to control Aedes mosquito, an important vector of the dengue fever. But, even though there’s substantial research done in studying this species, much more needs to be known about its ecology and life history. “This is largely due to its long larval stage, and some species are known to spend many months, and sometimes years, in the larval stage in water,” says David Raju, head naturalist, Singinawa Jungle Lodge, Kanha Tiger Reserve and co-author of the book Dragonflies of Kerala. Tiple mentions that the larval stages of only about 80 Indian species are known and the full life history is documented for only 15 species. “A good understanding of larval ecology is crucial for odonate conservation. The paucity of ecological information is a serious lacuna when designing any conservation measure,” says Tiple. And it is noted that there are threats to these species mainly due to habitat destruction. To state an example the habitat of Goan Shadow Dancer could be also under threat due to the government’s plans to construct a double railway track in the area of Collem, where this species was first found. Rangnekar suggests that it is too early to predict. “We aren’t in a position to know what the impacts of that would be yet. This group of dragonflies prefers flowing water to breed and any change in the water flow and quality can have an impact on this species. 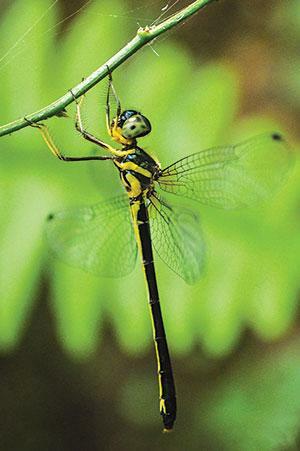 Dragonflies are water-dependent species and hence the quality of water defines the species composition,” says Rangnekar. Thus there’s room for more field work and demand for more funds as most of the researchers rely on foreign funds or crowd sourcing. Also, the odonate research at universities and colleges is negligible. “I feel that we should focus on quality research even if that limits our capacity to study everything everywhere. In the case of Indian odonates, such quality research is missing. For several species, IUCN status is not available or has not been updated. This is mainly because species-specific research and expertise is lacking. Published peer-reviewed research is limited. 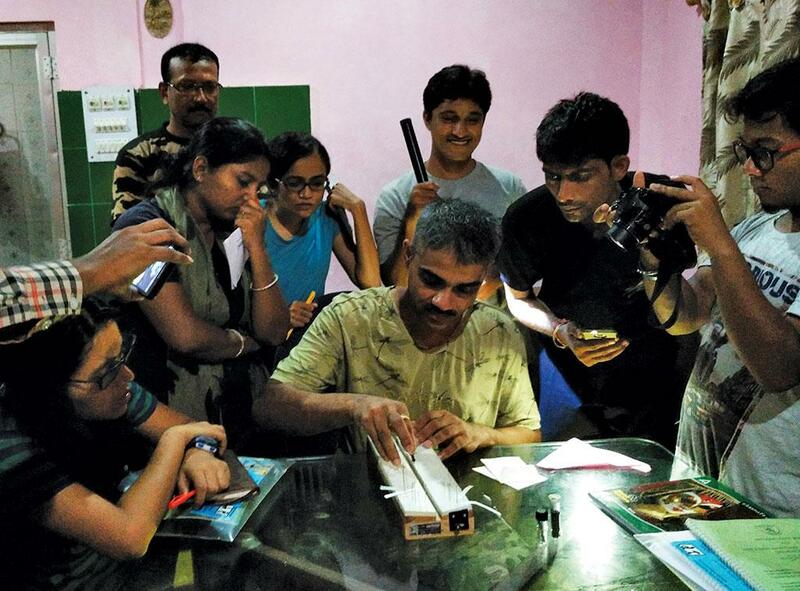 A major reason is lack of sufficient funds and trained odonatologists to conduct research,” says Pankaj Koprade, administrator of Dragonfly South Asia Group, a citizen science-based initiative with over 7,000 members that studies odonates. Raju suggests of publishing about dragonflies in popular journals, magazines, and newspapers, even in regional languages. “Writing will bring about more enthusiasm in young researchers and might push them to take up the dragonfly study seriously,” says Raju.